Posted October 5, 2009 by Tom Thumb. Nina Paley’s Sita Sings the Blues is quite astonishing. 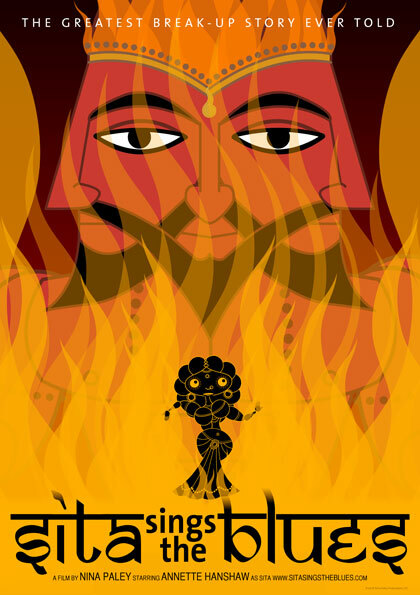 The musical animation combines classic Indian art, 1920’s jazz songs, classic myth, modern irreverence and a personal unhappy love affair to give a new spin on one of the oldest stories in the world, the Indian epic, the Ramayana. Paley’s retelling of the Ramayana was ironic enough to invoke the ire of the neo-fascist Hindus in India which is recommendation enough and brings a breath of fresh air to a stuffy classic. Rama as the perfect man and Sita as the perfect woman have long been sacrosanct concepts in India but in modern times the ancient story perpetuates the idea of the wife as the perfect doormat. Nina Paley brings this out with brilliant dialogue between the confused narrators and her understated wit in the animation accompanying the old jazz classics.